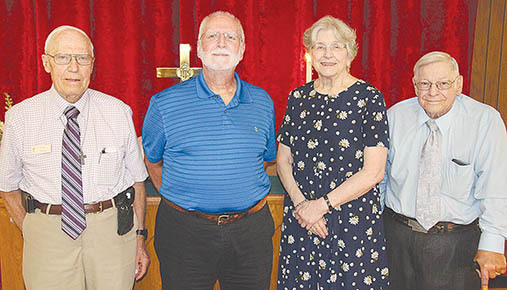 PAST MINISTERS — On hand for the Q-125 celebration at the Loretto United Methodist Church were, l.-r., Earl Reed, Dale Howard, Kathy Rice and Terry Otto. 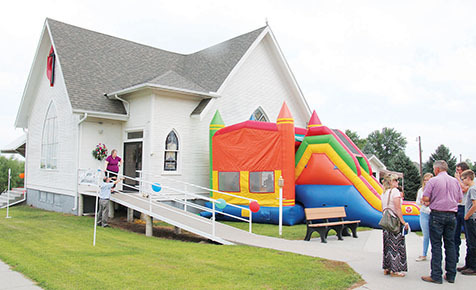 A capacity crowd was on hand for the 125th anniversary worship service of the Loretto United Methodist Church last Sunday, July 15. Most speakers focused on their experiences of growing up in the Loretto church and said the lessons learned there have stayed with them throughout their lifetimes. Rev. Janet Burgel, pastor of the Loretto and Albion United Methodist Churches, presented the welcome and introduced special guests. Rev. Bill Ritter, a native of Tilden, provided the sermon for the day on the importance of Christian dedication and taking risks, if necessary, to do what’s right. He pointed out that those who established the church in 1892, as the town of Loretto was also being established, put themselves and their finances at risk to do so. Christians should continue to follow that example, he said, always stepping forward to do what is right, regardless of the risk. Rev. Ritter now serves as district superintendent of the Elkhorn Valley and Blue River districts of the United Methodist Church. Also taking part in the service were former church pastors Earl Reed (1979-1984) of Norfolk; Dale Howard (1984-1990) of Ellisville, MO; Kathy Rice (2005-06) of Omaha, and Terry Otto (1998-2005) of Omaha. Loretto United Methodist Church members gathered outdoors for games and visiting after the Sunday service.